Apple has released security update 2011-003 which should remove most instances of this malware automatically. Details about the removal process provided by this security patch can be found here. You should receive this update automatically the next time your computer checks for system software updates. In addition, Apple Support document HT4650 outlines Apple’s recommended removal method for these malicious programs if you still need to remove it manually for some reason. Start in safe mode by turning off your computer completely. Press the power button to turn the computer back on. Immediately after you hear the startup tone, hold the Shift key. The Shift key should be held as soon as possible after the startup tone, but not before the tone! Release the Shift key when the gray Apple icon appears. Important: Follow this step carefully! 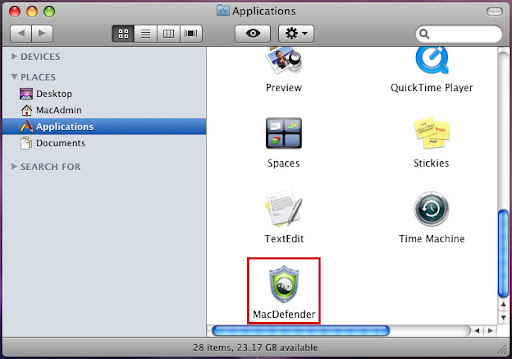 Find MacDefender.app or MacProtector.app and click and hold the application (do not double-click!) While holding the click-button down drag the application to the trash can on the dock and release. Reboot your computer as you normally would. To prevent this problem in the future with safari click Safari in the toolbar and select Preferences. Under the general tab unselect the checkmark next to Open “Safe” files including movies, pictures, sounds, PDF and text documents, and disk images and other archives. Congratulations, Everything should be back to normal! To remove the program automatically, you have a few options for virus scanners that can detect this malware. Home Users: Sophos for Mac, which is available for home users for free from here can detect this software. Business Users: ClamXav is available free, and can be downloaded here. College Students: If you are a UF student, you are entitled to use McAfee VirusScan for Macintosh (Virex) through the University of Florida’s licensing. While connected to the UF network you can download the software here.